Writing at the consistently excellent Washington Free Beacon, Alana Goodman reveals Chapter 918 of the Clinton Global Graft Almanac. 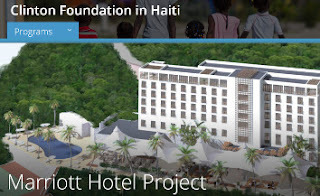 In this case, a conspicuous contributor to the Clinton Foundation successfully bribed lobbied the Secretary of State -- Hillary Clinton --- and the Clinton Global Graft Initiative itself for a hotel project in Haiti that successfully opened last March. Richard L. Friedman, a Boston hotel developer emailed Cheryl Mills, Clinton’s chief of staff, to tout the project on May 17, 2011 ... [noting] he recently had a discussion with Hillary Clinton at the White House and asked Mills to forward her a note for him. It is unclear what he and Clinton discussed, and portions of his email have been redacted by the State Department due to “personal private interests.” The note he asked Mills to send to Clinton is also redacted. ...Mills forwarded Friedman’s full email to Clinton and her scheduler, Lona Valmoro, on June 7 with the note “See highlight—resending.” The copy released by the State Department does not indicate which portion of the email Mills highlighted. ...[Friedman] is not the only Clinton donor associated with Marriott’s efforts in Haiti. The company Digicel Group teamed up with Marriott International in 2011 in Port-au-Prince to build a luxury hotel, which opened earlier this year. Digicel has contributed between $25,000 and $50,000 to the Clinton Foundation, and its owner, the Irish billionaire Denis O’Brien, has donated between $5 million and $10 million. Unigestion Holdings, a subsidiary of Digicel that was reportedly tasked with managing the hotel project, gave between $10,000 and $25,000. Marriott International is also a hefty donor to the Clinton Foundation, contributing between $50,000 and $100,000. According to a Marriott press release on Nov. 28, 2011, the Clinton Foundation helped arrange the partnership between the hotel group and Digicel. The Clinton Foundation's website proudly notes its "facilitation" of the agreements between Marriott and Digicel to build a 175-room Marriott-branded resort in Port-au-Prince. The co-mingling of Hillary's State Department business and the Clinton Global Graft Fund is, without question, one of the most amazingly successful scams since the U.N.'s "Oil for Food" racket. But there's nothing to see here, Democrat partisans, nothing at all. There's no scandal, and -- even if there is -- certainly nothing that can't be solved by Hillary cackling like a loon at the FBI's ongoing investigation of her mishandling of classified information. Or by Hillary adopting her typically pathetic fake southern accent to pander to African-Americans.